Earlier this week, Leading Edge partners Business Council for Africa – Invest Africa hosted a Francophone Africa: Heads of Mission event in London, in association with British Expertise International. The event was led by a panel consisting of Her Majesty’s Ambassadors: Catherine Inglehearn (Guinea), John Murton (Democratic Republic of the Congo and Republic of the Congo), Josephine Gauld (Côte d’Ivoire), George Hodgson (Senegal) and High Commissioner Rowan Laxton (Cameroon). Each Ambassador had the opportunity to discuss the current investment climate and the opportunities for British companies in the countries in which they are based. Ambassador Rowan Laxton began the session by noting that Cameroon’s large and diversified economy hosted an International Monetary Fund mission last week that will most likely lead to about US$80 million worth of funding coming the Cameroonian government’s way. This, he said, could be used in part to pay the arrears of international companies, which have been recently complaining of a delay in payments. Ambassador Gauld highlighted that Côte d’Ivoire’s exports of bananas and cocoa remain strong to the UK, and the country continues to be a hub and entry point to Francophone Africa for many international players. She said that Côte d’Ivoire is benefiting from an initial investment compact with the G20 countries and its economy looks set to grow, as the ease of doing business there steadily improves. The situation in Senegal was illuminated by Ambassador Hodgson, who pointed to major recent investment by the government of Senegal in infrastructure projects in Dakar and across the country, including a new airport and road network, and also stressed the importance that the oil and gas sector is likely to play on the country’s future, with BP and Cairn Energy seemingly ready to invest. Guinea is equally set for development. Although Ambassador Inglehearn observed that Guinea has been behind its neighbours in terms of economic growth, she explained that last year’s government-led investment and development conference in Paris raised around US$25 million in funding for public-private partnership projects in the country. She also highlighted that Guinea is rich in natural resources and has major potential for hydroelectric power exports to be tapped into. Perhaps the hardest sell to London’s investor community sat with Ambassador Murton, who is based in the Democratic Republic of Congo. In light of recent media reports, the country’s reputation is not as good as it could be. Murton illustrated the level of poverty in the country by describing its annual budget as being equivalent to a two-day spend for the UK’s National Health Service. However, he reminded the assembled throng that, in fact, one cannot forget that, by 2019, the Democratic Republic of Congo will be home to 73% of the world’s cobalt production – an essential ingredient in batteries and, therefore, electric vehicles. Something that is sure to tempt investors with enough capital to carry the risks. 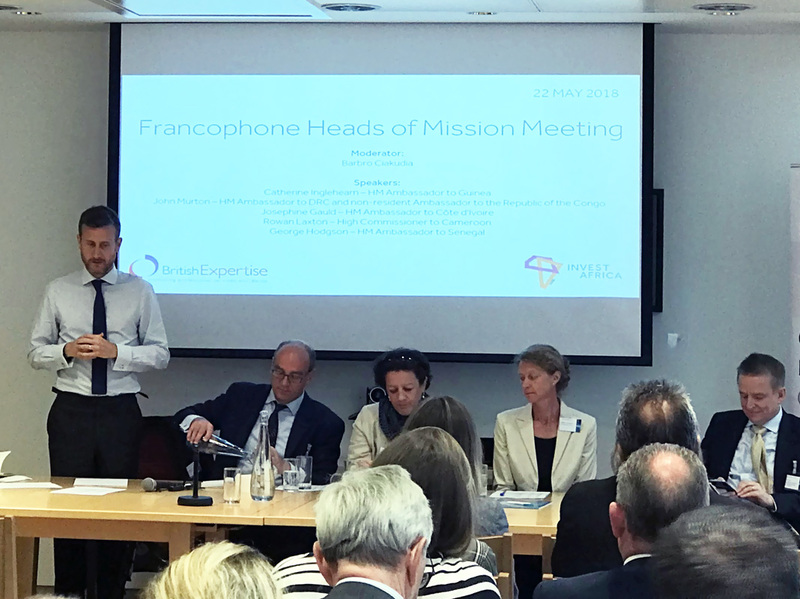 The event’s popularity emphasised the UK business community’s appetite for knowledge about Francophone African opportunities in a wide range of sectors and the experts on the panel provided an informative illustration of how varied the possibilities are in different countries. Leading Edge, as the creator of preeminent publications on investment destinations that get right to the heart of business opportunities, is proud to be associated with both the event and Business Council for Africa – Invest Africa.